Every Christmas, for the past 10 or so years, I have asked for the same thing: a flashlight and/or a pocket knife. Why? Because there is almost always a chance that every day that I will need to use one of them. I can recall when I was in elementary school 20 years ago and my dad brought home a new flashlight with a bright halogen bulb. As a kid, it seemed like an entire new world had been opened to me. Nighttime and darkness were no longer an impediment to having fun and exploring. Fast forward to today, and the proliferation and advancement of LED technology has changed the game when it comes to lighting and illumination. According to their website, “We have one simple goal: to put an Olight in as many people’s hands as possible.” Based out of Shenzhen, China, the company manufactures a wide variety of LED flashlights that cover the gambit of activities and uses. I received the I1R EOS Flashlight from Olight for testing and review purposes. 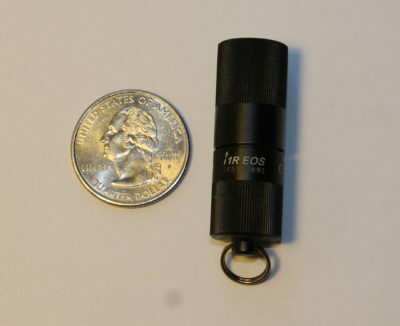 It is a compact, keychain LED flashlight with a USB rechargeable battery. It appears to be “simple” in design, needing only a twist to turn the light on/off and increase/decrease the power of the beam. More detailed technical specifications can be found here. LED removed to show USB charging port. Entire kit, including charger and flashlight. 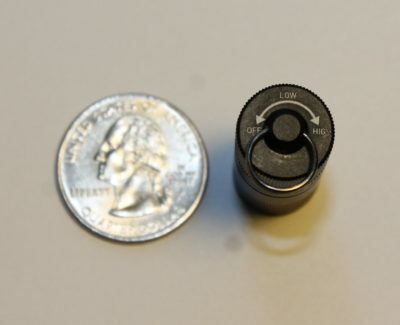 Detail of the bottom of the flashlight as well as size comparison. I am usually a fan of traditional non-rechargeable batteries, in case I need to replace them in the field or away from power sources. I will see how this rechargeable battery performs over the next month and if having to recharge the battery is an annoyance or a money saver. 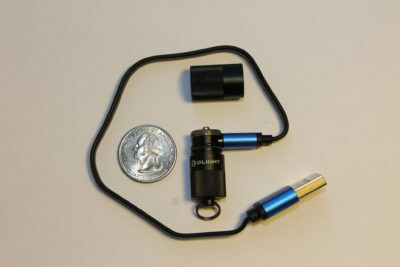 I plan on using the Olight I1R EOS Flashlight in a wide variety of settings. It’s a keychain light, so I will make sure it’s on my car keys. I am currently training for a 50k where most of my training runs start prior to 5 am. The flashlight will accompany me on these runs in case I need any additional illumination. 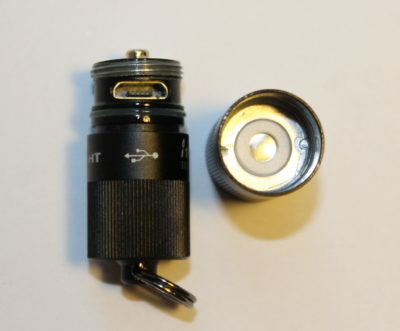 Check back in about a month for my update on how the Olight I1R EOS Flashlight has performed. Thanks to Olight and 4AllOutdoors for the chance to review this flashlight!